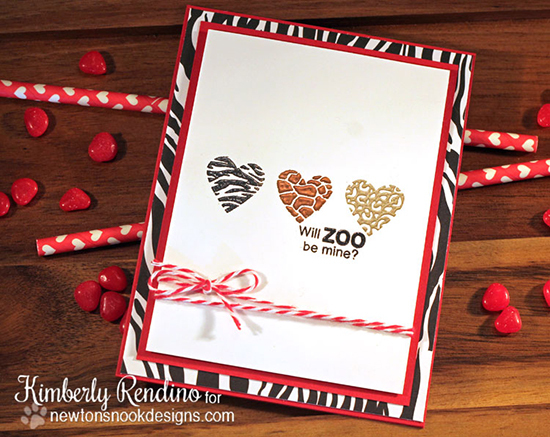 I love this fun animal print Valentine by Kimberly! She used the 3 little animal print hearts from our new Wild About Zoo Stamp Set and embossed them in different metallics! She also added the "will zoo be mine?" sentiment from the same stamp set. I love how she made the card really clean and simple and added just a hint of a zebra print border! Super fun! Take a minute to pop over to Kimberly's blog, Kimplete Kreativity today to tell her how much you love this! Sweet Treats Blog hop - Check out all the awesome treats in time for Valentine's Day! If you haven't had a chance to go through all the awesome Design Team projects from yesterday's blog hop, you still can. Check out all the fun treats and leave comments along the way for a chance to win a $10 store credit to Newton's Nook Designs! Start the hop at the Newton's Nook Designs post here. Love it!!! Love those animal print hearts and being embossed in metallics looks amazing! Fantastic card! Such a pretty card! LOVE the embossing! This is really awesome love that embossing.